In this most likely the last blog of the season, I would like to share some summaries of this past month, and this past season. But first, here are the recent lists from the 29th, 30th, & 31st. A photo of a 1st summer male Orchard Oriole that was found today can be seen above. In the month of May, 175 species were found by the tower. My personal count of individuals for the month was 37,249. The combined total of individual birds counted on all the days I visited the tower this spring was 136,879. At least two state records of single-day all time high counts were broken at the tower this spring. On April 12th 79 Eastern Phoebes broke the state record, and on April 13th 5,064 Rusty Blackbirds set the new state record high count. Regarding the single-day all time high counts for just the tower site, 56 species either tied or broke the previous record. Eventually all species’ seasonal totals will hopefully be available to see in the tab labeled “Longshore count results”. 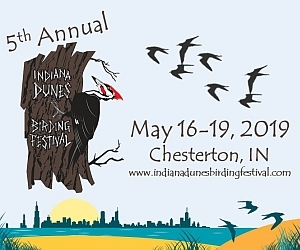 Although Spring migration is winding down in this area, don’t let that discourage you from birding here in the Indiana Dunes in the Summer; there’s a really nice selection of breeding bird species to see here too! Great job! I learned a lot from your analysis this spring. Thanks!